50% Off first two months on selected unit sizes.Free use of dump station for all RV storage customers! Self Storage Concord CA: Convenient, Clean and Secure! Why spend money on long term warehouse rental space when you can store your business equipment at Abba? Our extended gate hours offer you the flexibility needed to run a successful business with costs that don’t put a hole in your operating budget. Abba is the perfect place for contractors, landscapers and suppliers. Tight on office space? Abba is the ideal facility to store your important records and documents. Office space can be very expensive and require long term commitments while Abba offers you affordable storage on a month to month basis. We also offer a variety of sizes so you can rent only what you need. Use our clean, well maintained 14 foot truck to assist you when you move your possessions into Abba. Once on site we also offer carts at each building and wide aisles and hallways designed to make your move in as painless as possible. 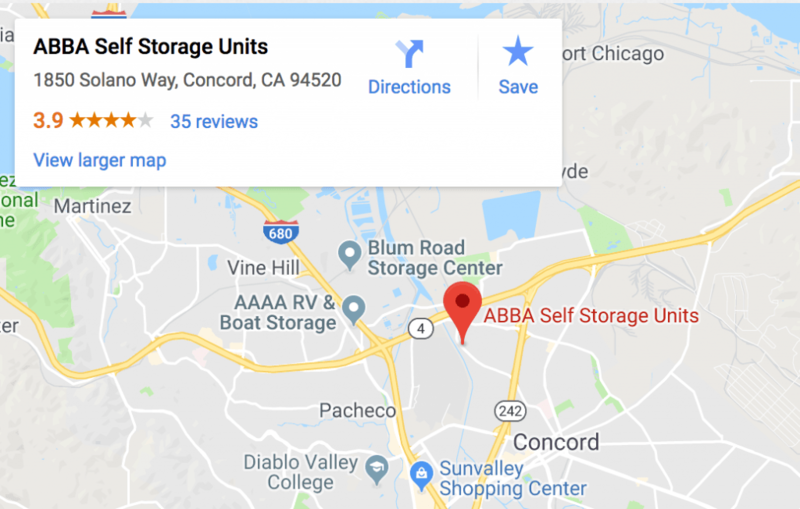 Abba Self Storage Units is a locally owned and operated self storage business in Concord, CA with easy access to Highways 680/4 and 242. We serve many satisfied customers in Concord, Martinez, Pleasant Hill, Walnut Creek and other East Bay communities. Our facilities are amongst the newest in the Bay Area with security and cleanliness being our highest priorities. Abba offers its customers convenience and flexibility. There are no long term contracts needed and numerous self and RV storage sizes to meet any need. Abba also offers climate controlled spaces for your items that require extra care. Abba provides state-of-the-art technology with old fashioned customer service. We offer competitive pricing to the Bay Area including our neighbors looking for self storage Walnut Creek, Pacheco mini storage units, or Pleasant Hill storage. We welcome your business and will work hard to keep it! Abba Self Storage Units in Concord is ready to serve your needs whether it is for large or mini storage units, more space for your business to grow, or boat and RV storage. We are conveniently located and take pride in providing customers in the Bay Area the most secure, clean facilities for self storage Concord CA offers.